Tantalus' Steampunk and Victorian Flasks are Geek Chic | It's not your tech, it's how you use it. I have a flask – I keep it full of delicious honey bourbon that I whip out whenever I’m having a really tough day (which isn’t that often) but the knowledge that I even have it is really what keeps my head cool. Now my flask just happens to be one of the many that the retailer of geeky awesomeness that you all already know, ThinkGeek carries. I have The Meh. Flask , but I’m thinking long and hard about picking up The Ethanol Molecule Flask , or even The Starfleet Flask , you know, because I’m a Star Trek fan at heart. Still, today’s topic isn’t any of those flasks, although I think the brushed aluminum and clean style make for excellent carrying, if you like what you see over there. No, we’re here to turn the clock Moncler outlet back a bit – or slip into another world altogether, and hook you up with some drinking gear designed after a little element of geek culture that’s near and dear to my heart: Steampunk. Tantalus Designs over at Etsy has a penchant for bringing some seriously gorgeous steampunk, Victorian, and Edwardian designs to hip flasks that actually look really sharp. Now I hear what you’re saying: “Who carries a flask anymore?” You do, that’s who. And if not, you should. Frankly, nothing says class like being able to spike your own drink, or chat up some lovely geek in a corner at a party and offer something stronger than the Heineken that the host has on tap, you follow? Especially if it’s something fancy and nice like a good whiskey or a smoky scotch. Swap our liquor and toss in water or juice for a quirky alternative that doesn’t involve alcohol. Don’t drink, no problem! Use it for a stylish alternative to medicine or vitamin bottles or even leave it on your kitchen window sill for sea salt! 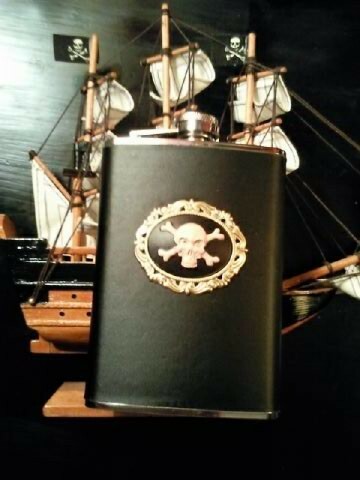 This flask looks great wherever! Wow, I have to hand it to them: I didn’t even think of that, frankly. They even sell flask funnels if you need a way to get your favorite liquid into one of their flasks without spilling it all over the countertop – and I can tell you from the time I tried to fill my flask with whiskey that even losing a drop is enough to bring tears to your eyes. Tantalus’ flasks are broken up by type: steampunk, gothic/vampires/horror, and pirates/faeries. Personally, I enjoy the steampunk flasks the most (especially this one with wings and gears on the leather face,) but there are tons of different types of geek, so you might find your favorites in the other categories. After all, some of the gothic ones are pretty swanky as well. And when you’re ready to share your precious cargo, Tantalus even sells collapsable metal shot glasses, perfect for giving a good friend a swig of what you’re carrying without forcing them to go straight to the flask like you do. You may not be able to keep the booze cold in a flask like this, but you can certainly keep it available, to say the least. After all, you don’t have to be an alcoholic to carry a flask with you, but a love for a delicious portable beverage you wouldn’t mind taking a swig of now and again is definitely required.